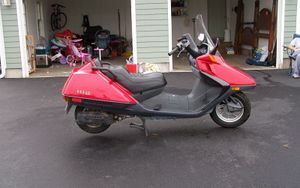 The Honda CN250 is a motorcycle produced by Honda from 1986 to 2007. 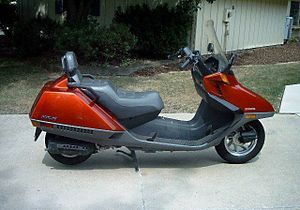 The Honda CN250 hit the US market in 1986. 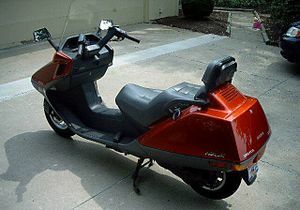 It was marketed in the United States as the Helix and in other parts of the world as the Fusion or Spazio. 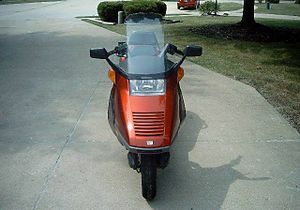 It was the first scooter on the market that made no apologies for being a scooter. The product was so successful that as of 2006, it is still in prodution. Honda has stated that 2006 will be the last year for the CN250. 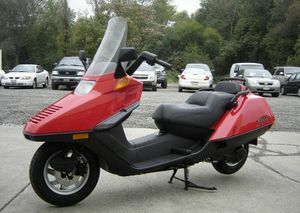 In the early 80's, Honda hit the market with a line of scooters known as the CH series, marketing the CH50, 80, 125, and 150. 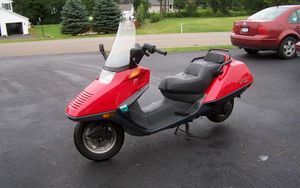 In the US, these were known as "Elite" scooters and overseas they were marketed under the "Spacy" name. 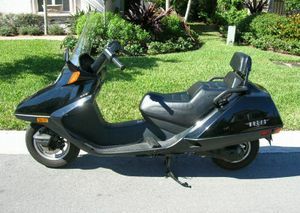 While these scooters were useful as "scooters", their speed and comfort level limited them to short rural riding on back roads and inner city riding. 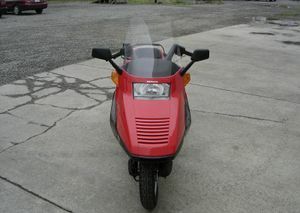 Then Honda hit the market with the CH250. 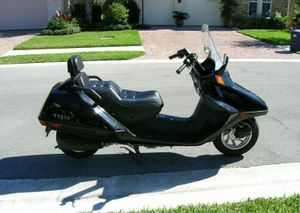 Overseas, this bike continued to be used in the city, but in the US the bike, with its ability to reach highway speeds, took on a whole new purpose as a long range touring machine. 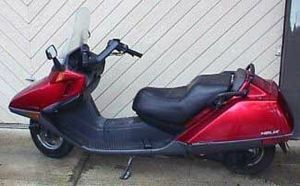 However, the Elite 250 still suffered from the limitations of all scooters such as limited storage capacity, short wheelbase, small size and relatively uncomfortable ride. Honda's response was the CN250 or the Helix. 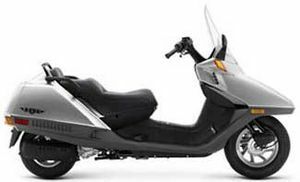 Basically, Honda added 14 inches to the Elite 250, placed an integrated "trunk" in the rear of the machine, and lowered the seat. The added length allowed what many have referred to as a "Barcolounger" seating position and a very smooth ride. The top speed of the machine was limited to 70-75MPH but the drivetrain was of an "understressed" design allowing extended running at or near top speed. In Japan, the Fusion was an instant hit. 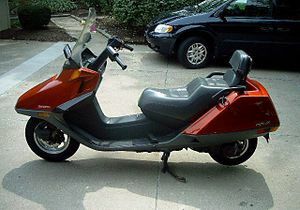 In Europe, the Japanese scooters forced the Italian makers to up their scooter's capabilities and reliabilty. 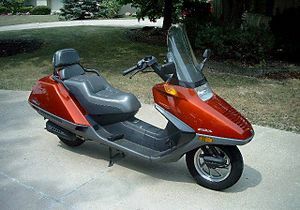 In the US, unlike other areas of the world, the Helix was a hit with middle aged and older people. 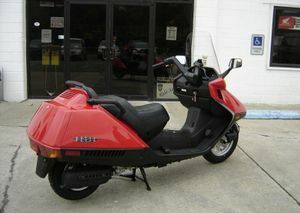 People that no longer wanted to or were unable to shift or hold up a large conventional motorcycle yet wanted long range touring ability bought the Helix. They were not disappointed. The CN250 was a deceptively capable machine complete with trip odometer, fuel and temperature gauges, glove compartment and trunk and plenty of room for two up. Furthermore, the understressed 250cc liquid cooled single cylinder engine could take the machine on 1000 mile tours with no issues whatsoever. There are many stories of extended touring with the Helix with the only concern being the relatively limited rear tire life of around 5000 miles, a function of the tire being of a very small diameter with a 10" rim. There are many records of Helix's reaching 70, 80, and even 100 thousand miles without so much as routine maintenance including valve adjustments and belt changes. In 2001, the Helix was in its last year being replaced by the NS250, marketed in the US as the Reflex and other countries as the Forza. 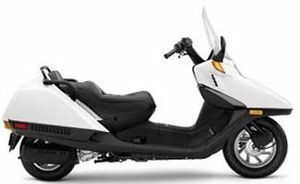 Comparing the Reflex to a Helix is much like comparing a sports sedan to a luxury car. 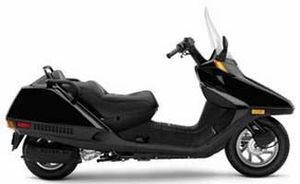 While the Reflex handled better and had a higher top speed, some argued that there was a tradeoff in seating comfort and ride. 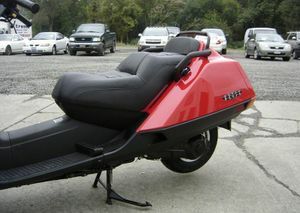 In the Japanese market, the Helix (Fusion) had an aftermarket and cult following with the younger generation not unlike sportbikes in the US. Seeing that the customer base was still there, the CN250 (Helix) made a return to all markets in 2004. 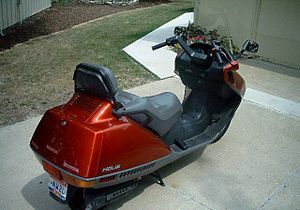 In the US the Helix sold next to the Reflex and both were priced similarly. But the days were numbered for the CN250. Superior machines from all scooter manufacturers were hitting the market. 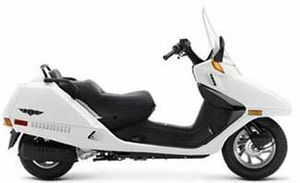 With that, Honda has decided to cease importation of the Helix to the US after 2006. At this point, it is unclear to this author if the Fusion in Japan will cease as well. 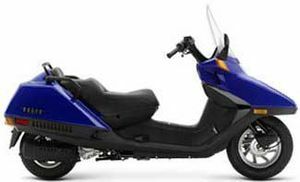 This is an unusual decision since recently Yamaha has hit the market with its own modern interpretation of the Helix, the Morphus not to be confused with the Yamaha concept Morpho. - Honda made very few changes to the Helix through its 20 year run. Aluminum rims replaced steel wheels in the early 90's and there were a few emission controls added to the engine. Beyond those changes, the machines stated the same right down to its 80's style, multi colored digital gauges. 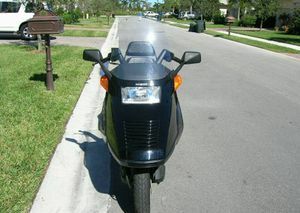 -In the US, man touring modifications were available. 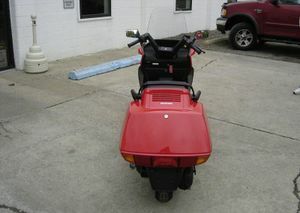 Increasing appeal to the older customers, third party accessories such as sidecars and tricycle kits were available. This article is originally from wikipedia. This page was last edited on 28 November 2010, at 21:01.